With the Christmas and New Year celebrations over and a new year of organising travel in Spain about to begin, I decided to take a short break with my family for a few days. I chose to go to Hondarribia in the Basque Country which is a beautiful medieval town with cobbled streets and which has a charming fisherman´s quarter with tall, colourful houses and great little restaurants. Hondarribia is situated on the mouth of the Bidasoa Estuary and looks across at Hendaye in the French Pays Basque. A more picturesque place would be hard to find and as a base for exploring from, Hondarribia offers a whole host of daytrips. 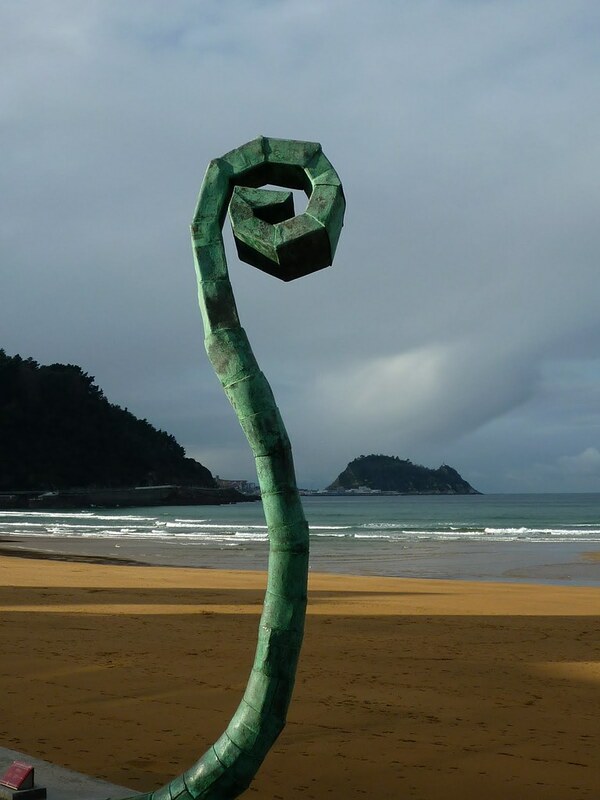 We set off on 6th January travelling from our home in Cantabria along the scenic Cantabrian and Basque coast. Along the way we stopped for lunch and a walk in the pretty town of Zarauz not far from San Sebastian. Zarauz is famous for it´s fine, sandy beach which draws many tourists in the summer as well as surfers seeking out one of the best beaches in northern Spain to practise their sport. 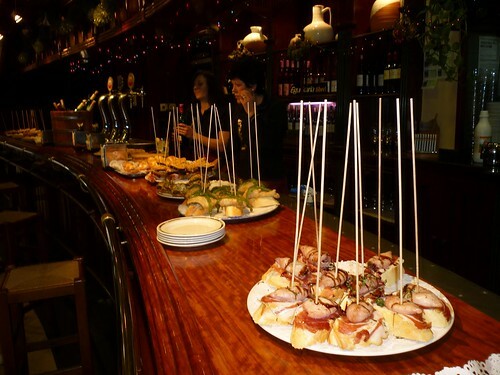 Zarauz is home to the charismatic and well-known TV chef, Karlos Arguiñano whose restaurant is here also. 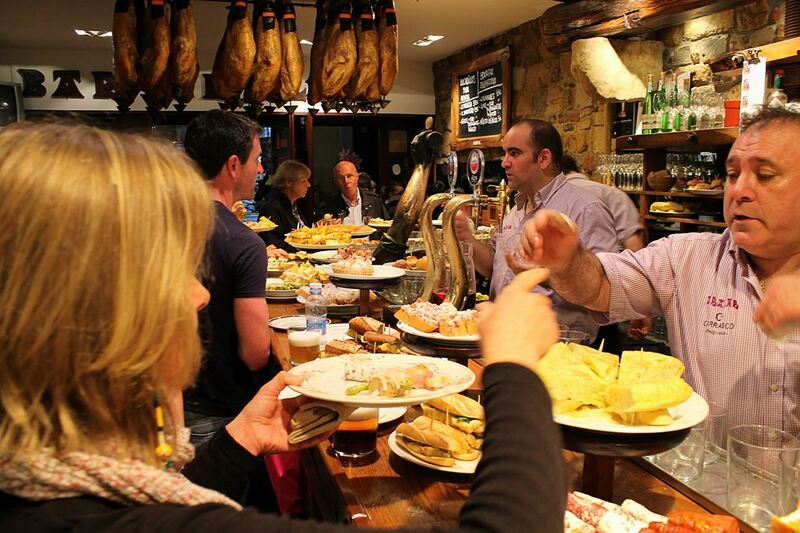 In fact there are many excellent restaurants in Zarauz where good food is taken seriously. The town is known for the production of txakoli, a dry white sparkling wine that comes from this region. Well worth trying if you ever get a chance. The town also boasts an excellent esplanade along which can be found quite a number of interesting sculptures. It´s a great town for families and many of Totally Spain´ clients have enjoyed staying in or near here over the years. Upon the recommendation of a friend we made our way for lunch to the Plaza Musika and the Txiki Polit Restaurant. This proved to be a good move for a number of reasons. The place is obviously a favourite with the locals and has a lively, friendly atmosphere. Upon entering we admired two nice murals by the very up-and-coming Basque artist Angel Uranga who is a native of Zarauz and has his studio here. The food in the restaurant was excellent and very good value for money. We ate their 18 euro menu and for this we enjoyed giant langostinos, seafood and mushroom crepes, fillet steak with a pepper sauce, dessert and wine. Truly satisfied we decided afterwards to stroll along the esplanade taking photos and admiring the sculptures. It was a perfect start to our break and it reminded us of how lovely the Basque coast is and what a pleasure it can be to travel in low season. Hondarribia was only a short drive from Zarauz and we were lucky to find parking right outside our hotel in the fisherman´s quarter, the very well run 3 star family owned Jauregui Hotel & Apartments. It´s a very good base for couples and for families. We booked one of their duplex apartments which was ideal. The apartments are currently being modernised with the bathrooms and the kitchens having already been completed. The rest will be done over the coming months but with no inconvenience to guests. After checking in we headed out for a stroll through the fisherman´s quarter, which was still very festive, and along the esplanade with views over to Hendaye with it´s backdrop of the Atlantic Pyrenees. It is extremely pretty and as sailing is very popular in this area the estuary is filled with colourful swaying boats which add to the lovely landscape. During the day a small launch shuttles people back and forward across the bay within minutes. Having picked up some tasty goodies at a delicatessen near to the hotel we enjoyed dining in this evening. Stay tuned – More on this trip to follow soon.